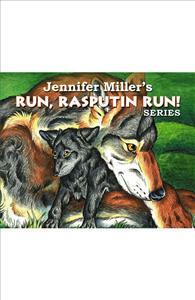 This is a wonderfully performed 7 CD Children's audio book, made up of three books from the "Run, Rasputin. Run!" series of books. Expertly narrated by Pat Fraley. Your entire family will enjoy these exceptional tales! Sasha the bear cub, on his own from poachers, finds new friendships as he struggles to realize his potential. Danger awaits in the jaws of the mean wolf, Rasputin. Trials and Friendships Book 2 -- Spring has arrived! But sudden illness befalls Sasha. Can he overcome his past, or will Rasputin the feared wolf hold the upper paw? Rasputin's Redemption Book 3 -- One night on a run to destroy Sasha and all his friends, the mean Rasputin jumps gleefully on a frightened prey. Finding it to be a defenseless wolf pup, he howls in sadness; his cries heard throughout the night. Will he leave it to die, or will he raise it as his own? An amazing series; so beautiful, dangerous, funny. About friendships, loyalty, bravery with many animals in all their splendor. I sure hope Disney or Dreamworks gets this, It'll be the best animated feature or series in over 20 years. Since it's a trilogy, maybe 3 movies. Ms. Miller is a master of mixing danger, humor and everything else together with great suspense and showing a wonderful insight into how animals must really think and interact with each other. I had a lot of fun with the audio and the 3 books, too. A couple of hundred really great illustrations in the books. Quite simply, this is one of the best books I've run across. While it looks like a children's series at first, the themes it contains-- friendship, bravery and the ability of love to change enemies into friends, are sorely needed in the adult world. Hats off to Ms. Miller, and I can't wait to see what's next. I read the 3 books first which is a must before the audio. It's a classic and will make a great movie. Add some songs and voila! A real gem! Can't wait. All the charactors are wonderful. He tackles the big mean wolf to save his friends and then Rasputin changes his act and saves the baby wolf and the healer saves Sasha and it's all great and a lot of fun. Nobody gets these cds or the 3 books. They can buy their own. My son spotted this on bbotw. He's only 6, but he loved the cover so much, he had to have it. I bought the 3 books, too, and wished we had read the books first. So starting tomorrow, we're reading the books and playing the audio in sections as we go. 3 of his friends are going to do it with us. This is all so unique and classic; make a great movie or tv series. What a great story and the narration is perfect. This is the first really worthwhile animal story I've seen with this scope, with special charactors, all so different, funny, charming, sweet or even mean old Rasputin running everywhere, causing panic and fear. Bravo. The beautiful cover attracted me at first, because my daughter is writing an essay about wolves. Then I bought the 3 books and it's all great; adventure, danger, friendships, you name it It sure has the right title, because old Rasputin runs and runs. Fun! I wrote to the Governor and all my friends did too to not let people shoot wolves. It's so awful, what's happening. Our Rocky Mountain states always take pride in rescue and refuge and protecting wild animals. The Rasputin series is beautiful and wonderful and exciting and funny and my kids, nieces and nephews love the 3 stories. We told the Governor to buy it and educate himself on the real nature of the wolf. This narrator, Patrick Fraley, is wonderful and the story is beautiful as old Rasputin drives the whole forest crazy, including all the other wolves. One wolf can sure make a difference. He sure is busy. The writing is so cute and so much fun. What a neat switch to have Rasputin be the bad, evil wolf and then gradually have him become a hero. Swell writing and so very emotional and funny too? Loved it! I work with 7 wildlife rescue, refuge, educational groups and it was great to see the real nature of the wolf brought into focus, instead of people, including Governors, be so eager to slaughter them. But that's the true nature of many so-called humans, while that attitude doesn't exist in the animal kingdom. But we have to keep trying. The narrator, Patrick Fraley is wonderful and the music and the whole audio and wonderful writing. Having Rasutin be the evil, nasty wolf at the beginning and slowly change into a great big hero by the end makes it all so special and all the animals are so cute and entertaining and this Patrick Fraley is so perfect with his narration and the writing is special too. Move over, Shrek. Here's a beautiful ORIGINAL story. Rasputin really scares the whole forest with his piercing howls and now my kids think it's cute to try to scare me with their howling, but I know it's them. A solid, fun story and I guess Patrick Fraley is world-famous for narrations and voice-over. He's great. My four children ar 3, 5, 7 and 9 and even my littlest girl Allison got into it, booing Rasputin at first and it was neat, seeing them respond to a terrific story. The whole evolution of Rasputin and the three stories is so much fun. I felt like my kids and I got to really know all the animals' charactor and individuality. I found myself matching them to my friends and relatives. Wonderful! The story, Rasputin, the danger and the humor are all terrific and the animal charactors are all quite lovable. So much fun with all the quaint personalities trying to not get eaten by the big, bad wolf, Rasputin. It's one hectic adventure, loved the narration and all the rest, too. Marvelous writing. I was lucky to read the 3 books first. Wow! Dan and I played this audio for our kids and they loved it. We already read the books to them and they got really excited all over again. They each looked through one of the books during the audio. It took 6 sessions but it was worth it. The narrator, Pat Fraley, along with Ms. Miller's writing, the 3 books and the audio are a masterpiece. It is all so very good and Old Rasputin is a terror and so real , so bigger-than life. I loved the owl and the bravest one, Mr. Mouse. I can still feel him biting on Rasputin's ear. The narrator, Patrick Fraley does great and the story is just wonderful. I should have read the books first, so I could see what all the animals looked like and all the graphics, which are the best I've ever seen in any book of any kind. I have three children and each one asks me to read the books time and again. Now we have the audiobook, and all of us are enjoying on our drives , the tale of Rasputin and all the other delightful animals. Love the books and the audio. What a story! Totally unlike any other we have. Thanks Ms Miller. Whats next? Rasputin raises Cain with the whole forest and scares the daylights out of all the animals until he finds someone who needs him and you'll have fun hearing how it all comes out. We read the 3 books first and Jennifer's writing and Pat Fraley narrating was just perfect. That nasty old wolf, Rasputin, sure raises heck with the whole forest, but he is full of surprises, especially when you don't expect it. The best animal story I've ever heard, but I'm glad I read the 3 books first. I ordered 4 sets for my each of my grandchildren who don't live near each other. The 3 books and audio will be the nicest personal gifts I can give them for the holidays. Samantha loves to draw and she'll sure have the best course in illustrating, 200 of them. Rasputin is quite a wolf and it's fun to see him go from evil to good and from the lone wolf to a family wolf. Great writing, lots of fun. Lots of fun and twists and turns and danger and funny and very realistic and the mouse and rabbit and owl and of course, old Rasputin constantly stirring things up. We have the 3 books too, so it made the audio so much better. The narrator, Pat Fraley, is wonderful on this terrific story of the evil old wolf Rasputin and all his intended victims and the other animals who help fight him off. From the beginning to the surprising end, this is one great story by Ms. Miller. It's so east to relate the personalities of these animals to people I've known and when Rasputin becomes a movie, I'm going to call them and tell them which animal they are. Great reading and beautiful, stimulating writing. A marvelous wolf, Rasputin, who goes from being a lone evil wolf to a big hero and Ms. Miller takes us on quite a ride with deep deep insight into wolves and ourselves. The 3 books are great too! Pat Fraley really does justice to a sensational story. I hope it becomes 1-2-3 movies. I love the title and all. It's perfect for all the commotion Rasputin cause. I loved every bit of it.